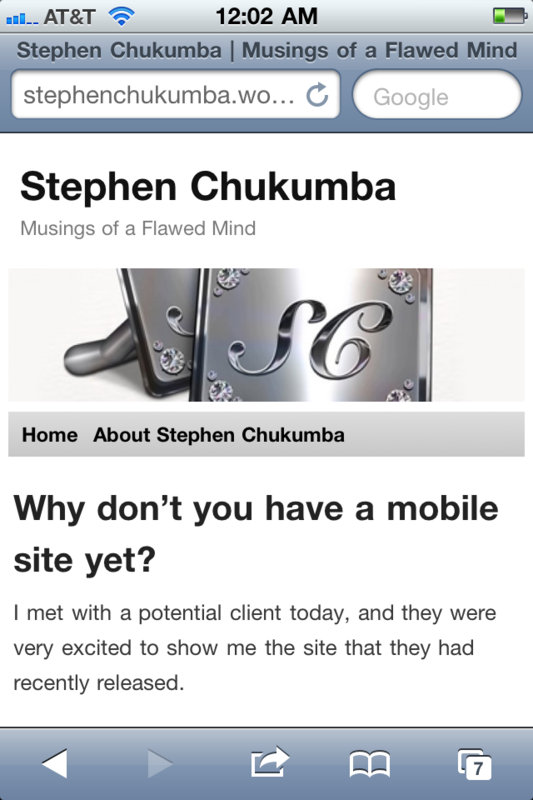 Why don’t you have a mobile site yet? Here is the mobile version of my blog. I met with a potential client today, and they were very excited to show me the site that they had recently released. The site had a nice stylish design, but when viewed from my iPhone, I was looking at the exact same site – and NOT a mobile site. Now, of course, I offered my unsolicited advice regarding the utility of a site, not optimized for mobile devices, and the growing trend of search from mobile devices. This experience underscores what I have observed in most of the brands I interact with. Many have failed to adopt a mobile web strategy. I’m certain that this ‘oversight’ stems from the fact that mobile is still not perceived as a significant element in most brand’s marketing mix. While apps may be all the rage, they really only apply to a small swath of devices, primarily iPhone, Android and Blackberry devices. Other internet capable devices, or users who haven’t downloaded your app (or aren’t aware of it’s existence among the hundreds of thousands of available apps), can’t take advantage of whatever utility your app was designed to provide. But developing a mobile website gives you the ability to still reach those users, without having to develop an on-deck app. More importantly, if your site comes up as a relevant result from a search conducted on a mobile device, when the user navigates to your site, they’ll encounter your mobile you (not your PC you). If your site it built right, you’ll convert that visitor into a member of your tribe, and they’ll bookmark you, share you or engage in whatever behavior you want guests to your site to perform. Anyway, if you’re interested in learning whether your recently developed site is mobile-compatible, simply pop your web URL into your mobile browser and check. If you’re using a open source platform like WordPress, many of their templates contain the option to publish a mobile version too (like this blog). If it’s not (or if you’re not sure) and you’re interested in learning how to convert, feel free to drop me a line.